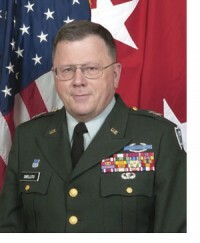 Major General Larry W. Shellito assumed duties as the Adjutant General of the Minnesota National Guard on November 3, 2003. The General’s military service began in 1968 when he enlisted in the active-duty Army. Prior to serving as the Adjutant General of Minnesota, Major General Shellito served as the Division Commander of the 34th Infantry Division, Assistant Division Commander-Operations, Assistant Adjutant General-Plans and Operations at Headquarters, State Area Command and commander for Troop Command, Roseville, Minnesota. 1. Nov 69 – Feb 70, Assistant S2/S3, HQ 5th Student Battalion, Candidate Brigade, Fort Benning Georgia.